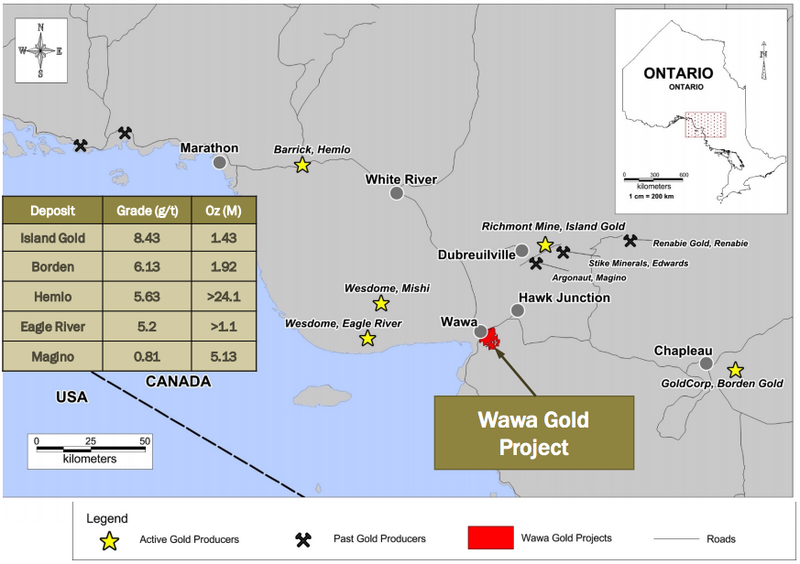 Red Pine Exploration Inc (TSXV:RPX) is a gold exploration company focused on developing its flagship Wawa gold project, located near Wawa, Ontario. Sitting within a mining-friendly jurisdiction that also hosts properties owned by Argonaut Gold (TSX:AR) and Alamos Gold (TSX:AGI), the project is supported by established infrastructure and a receptive and skilled community. Since becoming involved in the property, Red Pine has outlined an NI 43-101 inferred resource of 1.088 million ounces with grades of 1.71 g/t gold within the Surluga deposit, which remains open in all directions. In 2016 and 2017, Red Pine focused its efforts in conducting widespread drilling initiatives across the property to help grow the inferred resource and connect the available gold mineralization zones associated with previously-operated mines. 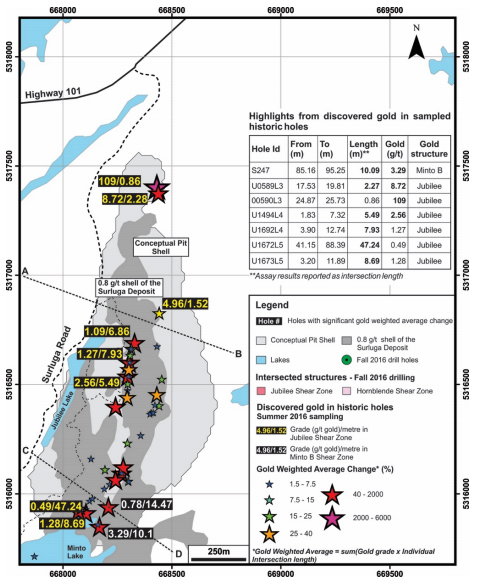 Drilling has been focused on four zones including the Minto Mine South zone, with grades of 19.92 g/t gold over three meters; the Grace-Darwin zone with 57.31 g/t gold over 3.14 meters and the Surluga North and Hornblende-William zones, which jointly presented grades of up to 14.66 g/t gold over 15.23 meters. Red Pine is continuing its exploration programs on the property, maintaining its focus on the identified drill targets. Owning 60 percent of the Wawa property, Red Pine is working with a strategic partner, Citabar LLP, that is financing the remaining 40 percent of the project. Working closely with a Red Pine management team that has significant experience in developing projects in Canada, the company’s partner is invested in advancing the Wawa gold project to production. The Red Pine management team also plays a leadership role in two other companies, Honey Badger Exploration Inc (TSXV:TUF) and MacDonald Mines Exploration (TSXV:BMK), with exploration focus across Canada. Under this structure, the three companies are able to share costs. Additionally, a combined diversified portfolio of materials and regions helps to de-risk the activities of the management team. The team is also notably invested in the Red Pine, holding 17 percent of shares. The next largest shareholder is US Global, which has been involved as a shareholder since early on, holding four percent of shares. By completing this form, you are giving consent to receive communication from Red Pine Exploration using the contact information you provide. And remember you can unsubscribe at any time. 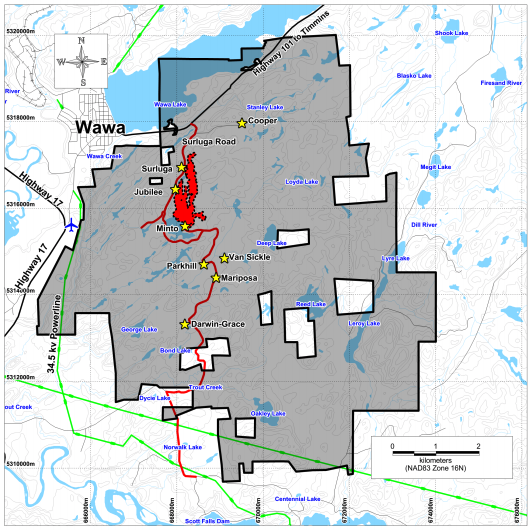 The Wawa gold project is a 5,568-hectare property, in which Red Pine has a 60 percent interest. The property is located two kilometers away from the town of Wawa, Ontario and sits within 40 kilometers of both Argonaut Gold’s Magino deposit and the operating Island Gold mine now owned by Alamos Gold, following their acquisition of Richmont Mines. Due to its prominent location in a safe and reliable jurisdiction, the Wawa gold property is supported by established mining infrastructure, an available and skilled workforce and a navigable regulatory system. The property is crossed by a powerline and is nearby both the Trans Canada Highway and the railway, making it easily accessible. Red Pine has also developed its local community relationships and recently signed a memorandum of understanding (MOU) with the Michipicoten First Nations (MFN) community, whereby both parties will consult one another during the company’s exploration activities. Historically, the property has hosted eight past-producing mines, with a collective production of 120,000 ounces. However, these eight deposits were owned by different operators and were never geologically connected. The largest deposit on the property is the Surluga deposit, which has seen 252 surface drill holes, 1,339 underground holes, and has historically produced 8,600 ounces. 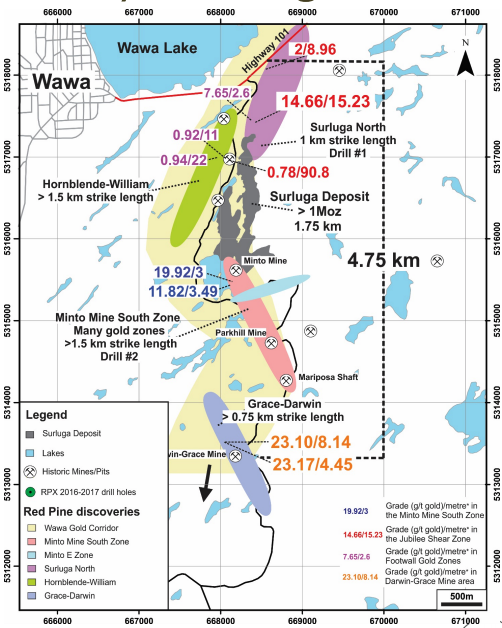 Since entering into the project in late 2014, Red Pine released an updated NI 43-101 inferred resource estimate for the Surluga deposit of 1.088 million ounces at 1.71 g/t gold contained in 19.82 million tonnes that are open along strike and at depth. Beyond the Surluga deposit, the company has also conducted additional work to determine the resource potential in the remainder of the property. As part of an initial sampling program, Red Pine sampled 146 historic holes and 46 percent of these returned additional gold findings. The samples returned grades of up to 109 g/t gold over 0.86 meters in an unsampled core. Over the course of 2016 and 2017, Red Pine conducted a broadscale drilling initiative across the property in the areas associated with the past-producing mines so as to develop the inferred resource and link the mineralization areas. Part of this initiative led to the discovery of a new high-grade zone in the Jubilee shear, which showed results of up to 14.66 g/t gold over 15.23 meters. The company’s exploration activities also prompted four other discoveries in the Minto Mine South zone, the Surluga North zone, the Hornblende-William zone and the Grace-Darwin zone, all located across the Wawa gold corridor. The exploration targets associated with these regions are estimated to hold a total 500,000 ounces to 2.5 million ounces that could be added to the current 1-million-ounce inferred resource. Adjacent to one another, the Surluga north and Hornblende-William zones sit on a 1-kilometer gold-bearing strike that runs parallel to the 1-million-ounce Surluga Deposit. To date, Red Pine has drilled 22 holes, seven of which showed signs of visible gold with grades of 5.37 g/t gold over 8.5 meters including 15.16 g/t gold over 2.9 meters. The company expects to conduct further drilling in the zone, developing the resource. The Minto Mine South zone is adjacent to the past-producing Minto mine and hosts a 1.5-kilometer strike that is open both along the surface and at depth. To date, just under 50 holes have been drilled on the property, of which 29 have presented visible gold with grades of up to 19.92 g/t gold over three meters and 34.6 g/t gold over one meter. The company will be conducting further drilling in the zone. The Grace-Darwin discovery zone is an area nearby the past-producing Darwin-Grace mine, to the southwest of the Minto Mine South zone. Over the course of 2016 and 2017, Red Pine has drilled 12 holes over the 750-meter strike. The zone has shown two separate high-grade zones with near-surface mineralization with grades of up to 57.32 g/t gold over 3.14 meters. Quentin Yarie is an experienced geophysicist and a successful entrepreneur with extensive project management and business development experience. He was previously the Business Development Officer at Geotech Ltd, a geo-physical airborne survey company, and a Senior Representative of Sales and Business Development for Aeroquest Limited. From 1992 to 2001, Yarie was a partner of a specialized environmental and engineering consulting group where he managed a number of large projects including the ESA of the Sydney Tar Ponds, the closure of the Canadian Forces Bases in Germany and the Maritime and Northeast Pipeline Project. He currently serves as President and CEO for Honey Badger Exploration Inc (TSXV:TUF), and as President and CEO for MacDonald Mines Exploration (TSXV:BMK), both resource exploration companies headquartered in Toronto, Canada. Craig Scherba is a professional geologist with over 20 years of mineral exploration experience both in Canada and abroad. He was an integral member of the exploration team that developed Nevsun Resources; high-grade gold, copper and zinc Bisha Project in Eritrea and led the exploration team that discovered Energizer Resource’s world-class Molo Graphite Project in Madagascar. Scherba serves as President and CEO of Energizer Resources (TSX:EGZ) and is the Vice President, Exploration of MacDonald Mines Exploration Ltd (TSXV:BMK) and Honey Badger Exploration Inc (TSXV:TUF). Marc Johnson is a bilingual senior executive with over 20 years of business experience, including 10 years at public corporations as CFO, VP Corporate Development and other financial management positions. He also has 10 years in capital markets in investment banking and equity research. He also holds a Bachelor of Commerce (Finance) from the John Molson School of Business at Concordia University in Montreal. Johnson is currently the CFO of Energizer Resources Inc (TSX:EGZ), Red Pine Exploration Inc (TSX-V:RPX) and Honey Badger Exploration Inc (TSXV:TUF). *Disclaimer: The profile provides information which was sourced and approved by Red Pine Exploration Inc in order to help investors learn more about the company. Red Pine Exploration Inc is a client of the Investing News Network (INN). The company’s campaign fees pay for INN to create and update this profile page, to which links are placed on Investingnews.com and channel newsletters.